Take a stand against racial injustice by urging your ASUC student government to pass SB 142 in immediate consideration at tonight’s Senate Meeting in Eshleman Hall’s Senate Chambers at 7 p.m.
On October 30, 2012, UC Berkeley’s fraternity Theta Delta Chi prominently displayed a body hanging from a noose by the doorsteps of its fraternity. This effigy was exhibited without regard to the historical atrocities, damaging emotional impact, and the elicitation of white supremacy that nooses continue to have on communities of color today in and around our community at UC Berkeley. 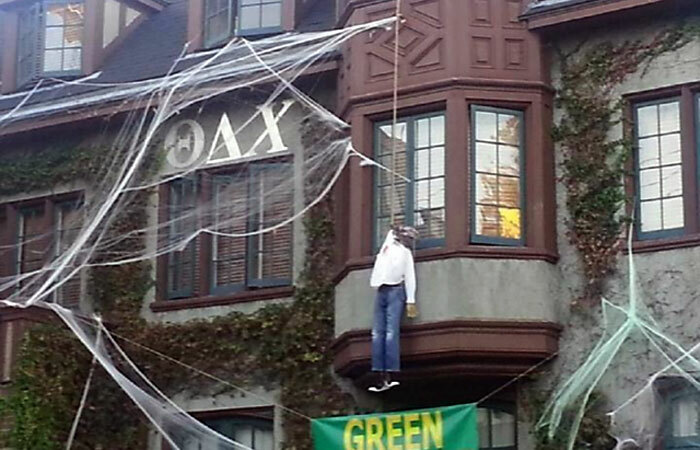 While it has already been stated and acknowledged by TDX that the racially insensitive Halloween decoration was not their intent, there is a fine line that gets drawn between the intent of actions and the impact of those actions as well. While the intent of the decoration was not malicious, the impact of it has gone beyond the issue of the decoration itself. This incident is indicative of a greater matter at Cal: there is a perpetuation of racial injustice at our University that continues to reinforce a hostile racial climate and damages the physical and emotional safety of students. SB 142 is an effort to affirm the commitment that the ASUC and UC Berkeley should have to promote a more inclusive climate that is conscious of the impact words and symbols have on and beyond our campus. In the practice of the Unity Clap, “Isang Bagsak” means one down, one fall and this week, one of our allied communities was hurt by insensitive and unconscious racist actions. We humbly request your presence at tonight’s Senate meeting because, when one of our communities is hurt, we all hurt with them. On the same note, tonight we will stand and rise with the Black community again as we take a stance together against racial insensitivity. Attached is a copy of the bill that was submitted to the ASUC this week. See you tonight!